A perfectly tapered accent table that fits independently with any furniture in your home, this piece features a chic cappuccino surface area perfect for your snacks, drinks or meals. The chrome metal base with an hour glass accent provides sturdy support along with a fashionable touch that will suit any decor. 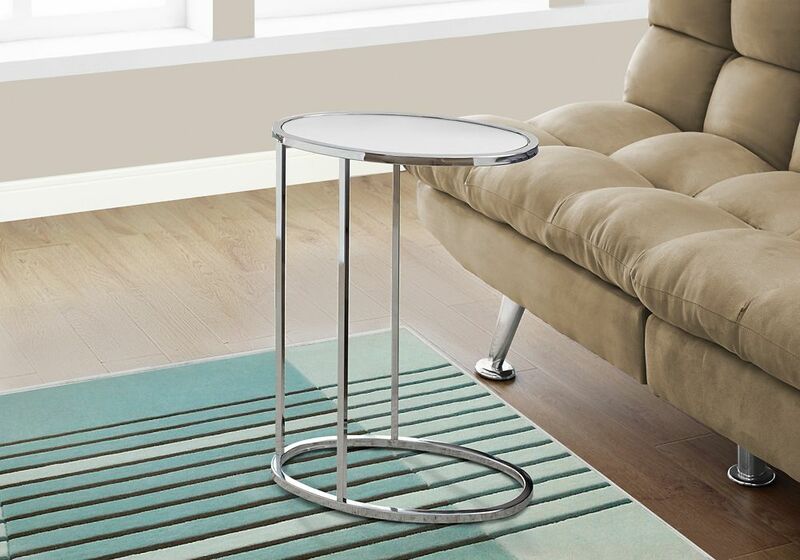 Accent Table - Oval / Mirror With Chrome Metal This modern oval accent table is the perfect combination of style and functionality. With an oval mirrored table top and oval chrome base, this accent table will add a contemporary touch to your living space. Designed to easily slip under your sofa to keep it conveniently close, this is the ideal accent table to hold your drinks, snacks, meals, or electronic devices. Lounging on the couch has never been more convenient! A truly versatile table for your living room, family room, den, or office.